[NOTE: The students in the video – TWO of them – are holding signs and saying nothing, letting him speak]. What does it take to make an authoritarian completely lose their cool? Not much, if the recent demonstration by Maine’s Governor Paul LePage is any indication. Maybe it’s just me, but American authoritarians seem to be getting progressively more thin-skinned. Whether it’s Trump or LePage, modern fascist-wannabes are terribly sensitive little flowers. Real authoritarians, like Benito Mussolini, would never have been caught dead throwing temper tantrums in public. Maine’s governor is a special case, though. 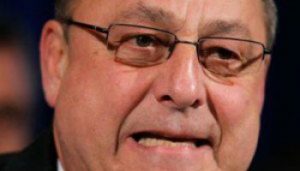 LePage is well-known for his belief in, frankly, some really weird conspiracy theories and quite possibly has ties with right-wing extremist groups. And that’s just the short list. You can find more here. LePage, as you can imagine, isn’t very popular. And that unpopularity caught up with him on Tuesday, when he was invited to dedicate a new education center at the University of Maine at Farmington, according to the Portland Press Herald. As he was preparing to give his speech, the governor spotted signs that attacked him as “Maine’s shame.” Other signs gave him an “F” on his environmental record. Thank you, you idiots out back there with the signs. The chancellor of the University of Maine took over the governor’s place at the podium and continued the dedication ceremony after LePage stormed off in a huff. Most normal adults should’ve realized that criticism is a part of life by now. LePage, however, is a Teabagger — to him, criticism is only legitimate so long as it’s being directed at not-white people.